A man has been arrested following a "sudden death" of a 60-year-old man in Swansea. 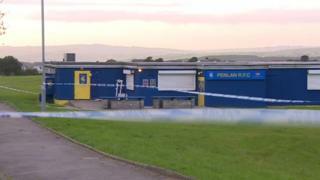 South Wales Police said officers were called to Heol Gwyrosydd near Penlan Rugby Club at about 13:30 BST on Monday. The area surrounding the scene has been sealed off while detectives investigate what happened in the incident. The force has appealed for anyone who saw the incident or has any information to call 101.